I know this dead horse has been beaten. But here are some reminders about things that slip through the cracks. Every once in a while, google the name and alternate names of your organization and check the universal (not personal) results. I did this a while ago and was shocked to discover that the one image that showed up next to the results was of someone injecting heroin into their arm! Oh my god! As it turned out, one of our librarians had written a blog post about drug abuse research and that was a book cover or illustration or something. None of us knew about it because why would we google ourselves? 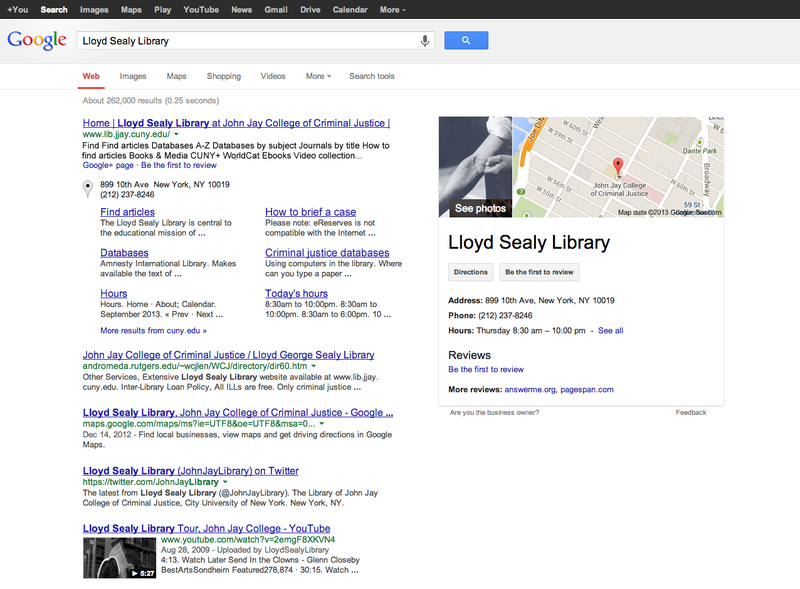 Well, now we google ourselves. Claim your location on Google+. 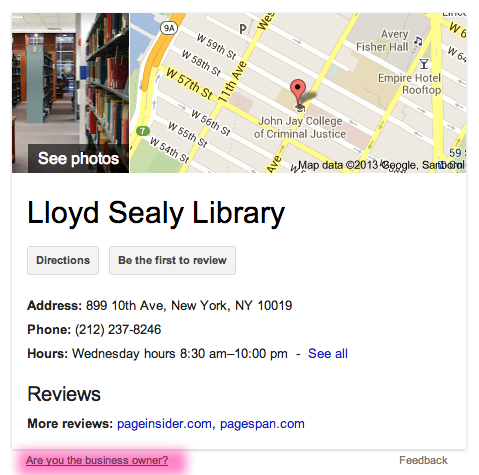 Click the “Are you the business owner?” link (pink in screenshot at right). You’ll have to verify before you can make a basic page. But in doing so, you will have some control over the photos that show up next to the place name. For example, I posted some of my better library photographs to our Google+ page, and they soon replaced the heroin arm. 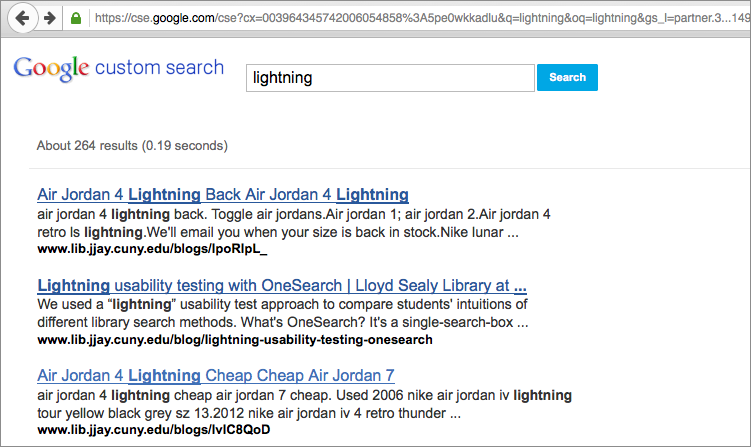 Sitelinks are the sub-categories that show up beneath the top search result. In our case, it’s things like ‘Databases’ and ‘How to find books’ — appropriate for a library. But there were also some others, like ‘Useful internet links’ (circa 2003) that were no longer being updated, so once verified as webmasters, we demoted them. 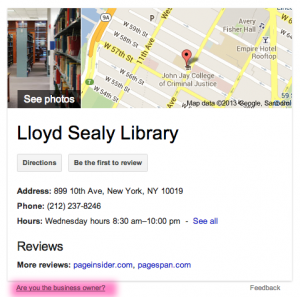 Since place-based search is the thing now, you’d better keep tabs on your Foursquare, Google, and other reviews pages. For one thing, it’s great to identify pain points in your user experience, since we are now trained to leave passive-aggressive complaints online rather than speak to humans. Example: our Foursquare page has a handful of grievances about staplers and people being loud. Okay, so no surprise there, but we’re trying to leave more positive tips as the place owners so that people see The library offers Library 101 workshops every fall when they check in, not Get off the damn phone! (verbatim). 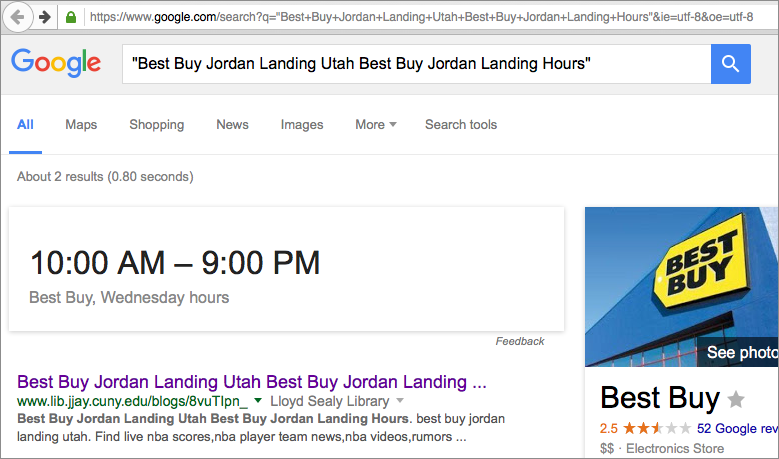 Add to your front-page results. If there are irrelevant or unsatisfactory search results when you look up your organization, remember that you have some form of control. Google loves sites like Wikipedia, Twitter, YouTube, etc., so establishing at least minimal presences on those sites can go far. All right, good luck. Here’s hoping you don’t have photos of explicit drug use to combat in your SEO strategy. P.S. 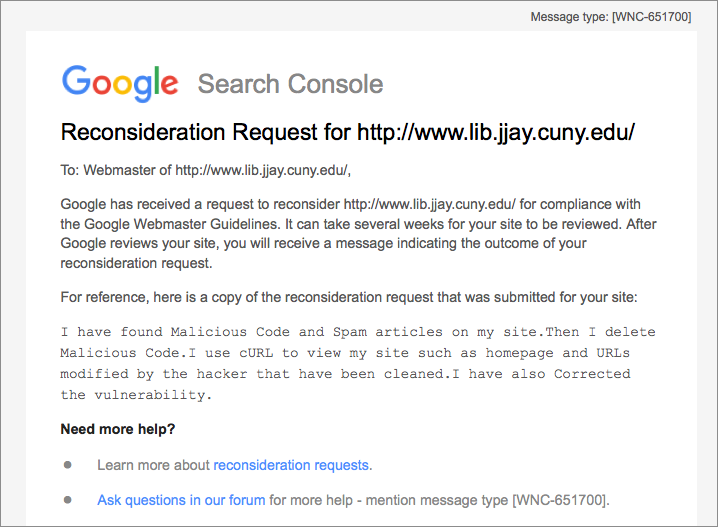 If you use the CUNY commons, try the Yoast WordPress SEO plugin. It is really configurable, down the post-level. One Friday night a few weeks ago, all was peaceful here in the library. Everyone else had left, the lights were dimmed, and I was wrapping up a few last things before heading out to my weekend. I had done a few tweaks to the site’s dropdown menu CSS, and as I put on my scarf and coat, I casually pushed them from our development server’s Git repository to our remote master repo, then pulled the commits down to our production server. 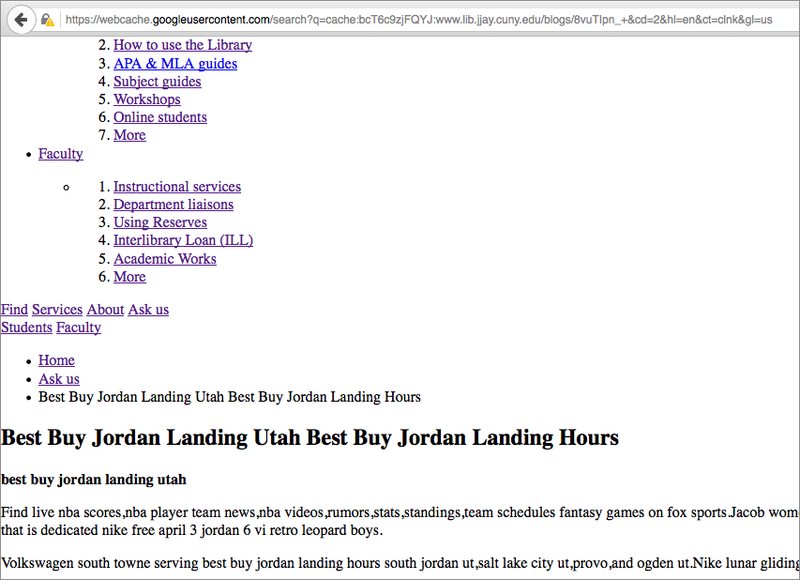 I reloaded the library webpage. It had gone completely blank. As the panic slowly seeped into my bloodstream, I reloaded again and again, even looked at the source code — nothing, not even a space or error message. I had never rolled back any changes before, and the Git cheat sheet I have tacked to my wall didn’t have enough information about undoing mistakes to make me comfortable about rushing off a command. I called our Drupal consultant, who answered his cell phone while driving and spoke in a calming voice about how this is why we use version control, just revert to a safe commit, and it will all be okay. Every StackExchange thread featuring this command also included dire warnings that had previously frightened me away from using it, but if you really do want to wipe out changes in your local repository (in this case, whatever had just been pulled down to our production server), this is how you do it. The site came back up as it had been before, after maybe five or ten minutes of downtime. I breathed a little easier and left for the weekend. But why had it gone blank? This was what I had to look into when I got back. If I pulled the most up-to-date commits down from the remote repo again, the site would still blank out. (I knew because I tried, hoping the WSoD had been a fluke. It wasn’t.) There were 60 changed files in the commit, mostly CSS, PDFs, and files for two non-essential modules. Even weirder, why was the up-to-date dev site totally fine? Until we fixed whatever was wrong on the production site, we’d have to pause development. No more space on virtual machine? PHP execution time limit too low? This error matched our server logs and Drupal error reports. The file that required opening had been deleted in the toxic commit, but at first it didn’t seem like that would be the problem. The Admin Views module is only visible to logged-in administrative users who want a more tricked-out menu bar at the top of their screens — why would it bring the site down? In exasperation, I disabled the Admin Views module and tried again to pull down — and voilà, the site was still there, updated, and looked fine. Apparently, that was all I had to do: turn off the module causing problems so the site code wouldn’t quit out on me. If it were a more essential module (not just one for a few admins’ convenience), we would have had to look into this issue further. For now, having caused enough headaches for myself, I’ll leave well enough alone. 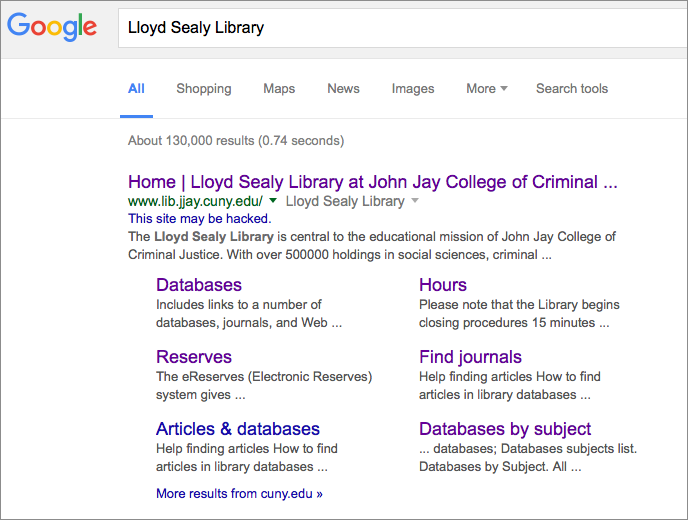 The Lloyd Sealy Library website uses Drupal 7 as its content management system and Git for version control. The tricky thing about this setup is that you can keep track of some parts of a Drupal site using Git, but not all. Code can be tracked in Git, but content can’t be. Content: Keeping the content up to date on both servers is a little hairier. 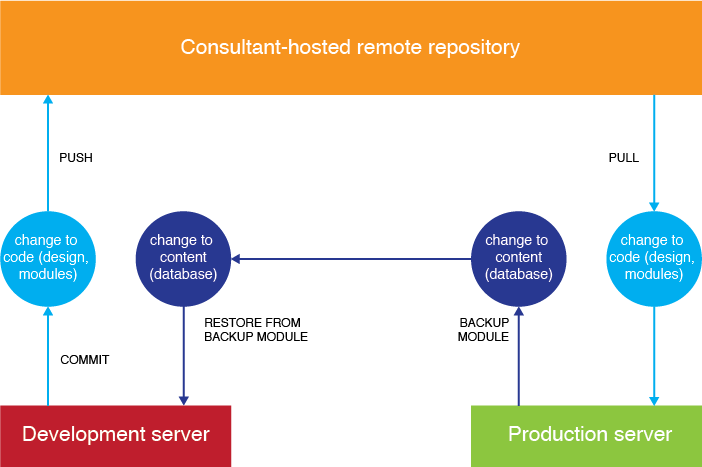 We use the Backup and Migrate module to update our dev database on an irregular schedule with new content made on the production server. The only reason to update the dev database is so that our dev and production sites aren’t confusingly dissimilar. Additionally, some CSS might refer to classes newly specified in the database content. The schedule is irregular because the webmaster, Mandy, and I sometimes test out content on the dev side first (like a search box) before copying the content manually onto the production site. Why have a two-way update scheme? Why not do everything on dev first, and restore the database from dev to production? We want most content changes to be publicly visible immediately. All of our librarians have editor access, which was one of the major appeals of using a CMS that allowed different roles. 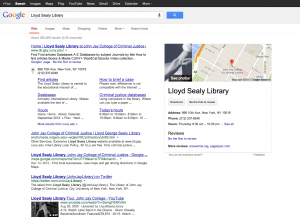 Every librarian can edit pages and write blog posts as they wish. It would be silly to embargo these content additions. Help: A lot of workflow points are covered in Drupal’s help page, Building a Drupal site with Git. As with all Drupal help pages, though, parts of it are incomplete. The Drupal4Lib listserv is very active and helpful for both general and library-specific Drupal questions. Non-Drupal files: Lastly, we have some online resources outside of Drupal that we don’t want clogging up our remote repository, like the hundreds of trial transcript PDFs. These aren’t going to be changing, and they’re not code. The trial transcript directory is therefore listed in our .gitignore file.